After more than a year of planning and partying in New Orleans and throughout the country, Loyola University New Orleans’ centennial celebration has come to an end—but not without a few lessons learned along the way. What was originally conceived as a means of highlighting the university’s achievements (and there have been many) for the past 100 years became something far more for everyone involved. 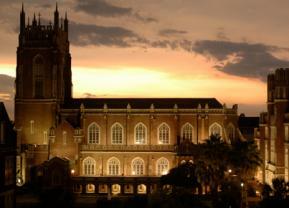 Who was the first president of Loyola University New Orleans? Father Albert H. Biever, S.J., served as the first president (1904 – 1913). He was born in Luxembourg on April 24, 1858. His family was devoutly Catholic, and he and a brother became Jesuits; Biever attended a Jesuit college in Turnhout, Belgium. After joining the Jesuits, he was sent to Grand Coteau, Louisiana, in 1875 for his novitiate. In the 1990s, one of the Jesuits at Loyola used to joke that the Saints would win the Super Bowl before a Jesuit would be elected pope. These days, there’s no need to joke about either. But there is a difference in how both events have been received. Unlike the massive celebration that swept New Orleans after the Saints’ historic NFL championship run in 2010, the Jesuits and the Loyola community have been somewhat more reserved in their reaction to the March election of Argentine Cardinal Jorge Bergoglio as the Catholic Church’s first Jesuit pope, Francis. For Greg Suire, communications ’92, baseball has always been an integral part of his life. He grew up playing the game and even went to Southwest Community College after he graduated high school just to play baseball. During his time at Southwest, however, he began to feel something was missing from his education. Suire had always wanted to attend a Catholic high school in Baton Rouge when he was younger, but he couldn’t get in. Still desiring a Catholic education while away at Southwest, Suire found the Jesuit ideals at Loyola University of New Orleans, as well as its communications program, appealing.